Jewish Summer Camp for Adults! My love story starts with an anonymous post-it note. 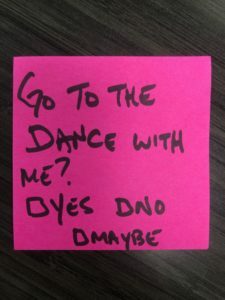 “Would you go to the camp dance with me? Yes, No, Maybe.” I paced by her room, nervously twirling the square neon paper in my hand. Sliding the note under her door, I ran down the hall to avoid being seen. My sticky note was anonymous. If it was meant to be, she would know who it’s from. It was the first night of Camp Nai Nai Nai, a Jewish summer camp for adults. More than 125 ‘campers’ in their 20s and 30s were asleep in their bunks ready for a weekend filled with nostalgia, joy, self-exploration, and for her and I – an entirely unexpected love story. I love camp because I love to play. I believe it is an essential part of who I am and I love to share that with others. I believe that our Jewish community (and those who love us) can be transformed by the power of playfulness, creative expression, and authenticity. And you can find it at camp. She came to camp for the flash mobs – I came for the glow in the dark laser tag. And we met somewhere in the middle. Nearly two years and three Camp Nai Nai Nais later – we’re still together – and Camp will forever be our special place. I invite you to come make it yours.